Did you know Angus Australia has an App? Home » 2018 » Did you know Angus Australia has an App? The Angus Australia app is available through the Apple store or Google play and can be found by searching for Angus Australia. The app is designed for doing simply searches on individual animals or looking up individual animals within current sale catalogues. Users wanting to do more complex searches will need to use Angus.Tech through an internet browser. The app enables users to search for animals based on their Animal name or ID and will bring up the same information that would be found on the summary tab and progeny tabs within Angus.Tech. This will give users access to basic details about the animal, the genetic condition status for the 4 major genetic conditions, pedigree and progeny information as well as the animals EBVs and EBV chart. If you have already installed the app it is important to ensure you are using the most current version. 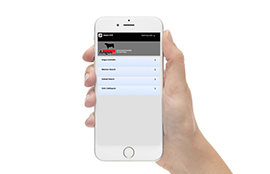 To check for updates simply open the app, select ‘Angus Australia’ from the home page and then select ‘Check for updates’.